Stew is a filling and hearty meal made of cut up vegetables, herbs, spices, potatoes, pasta or rice and cut up meat. 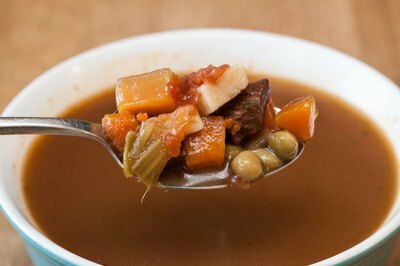 Because stew cooks on a low simmer, it is possible to use a less expensive cut of meat that will become more tender as it cooks and simmers with the added broth and vegetables. Ingredients can be any type of meat or vegetable combination that is preferred. A stew can be mild or spicy. It is an easy meal to prepare thrown in to a pot. A large pot of stew can feed a family. To thicken stew as it cooks a couple different techniques can be used separately or together. Thicken your stew with flour. 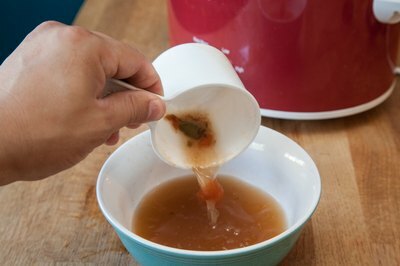 Once all the contents of the stew are added and cooked, remove one to two cups of liquid from the stew using a cup or ladle. Pour the liquid into a small mixing bowl. Stir in 2 Tbls of flour. Mix together briskly with the hand whisk until the flour is mixed thoroughly. Make sure all the clumps are dissolved. Add more flour if the liquid has not made a thick soupy consistency. If the mix is too thick and doughy, add more liquid from the stew and stir in the mixing bowl until it thins down. 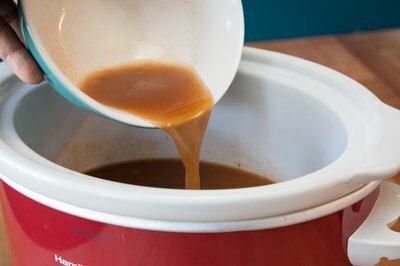 Make sure it is all mixed together and dissolved, then pour it back into the stew. Stir it around as you add it back into the stew pot. Repeat the process if the stew is still not thick enough for your preferences. It is better to do it a bit at a time to make sure the stew does not get too thick. Use this second method to make the stew more filling and thicken naturally. Mince herbs and vegetables that are part of the stew recipe. The stew sauce will be thicker and heartier if there are both large cut pieces of meat and vegetables for the stew and minced up herbs and vegetables to help thicken it. Use cornstarch as an alternative to flour. Add softened butter to the flour and water mixture to make it richer. An overview of using okra or file powder to thicken gumbo. The taste and textural influences of the two ingredients are discussed.